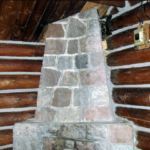 Interior and exterior insulation is possible in log homes with chinking and caulking done right. 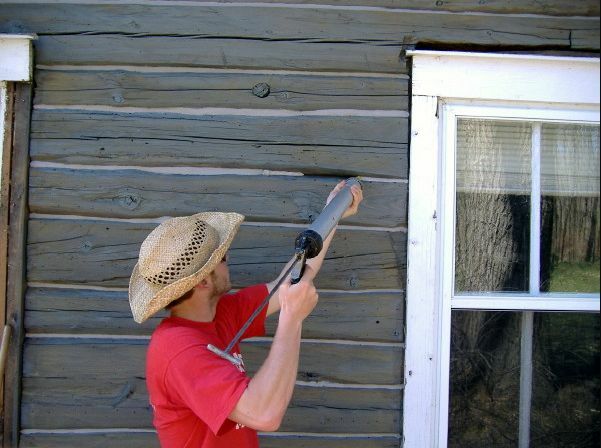 Chinking and caulking in log homes may be done for aesthetic or practical purposes. 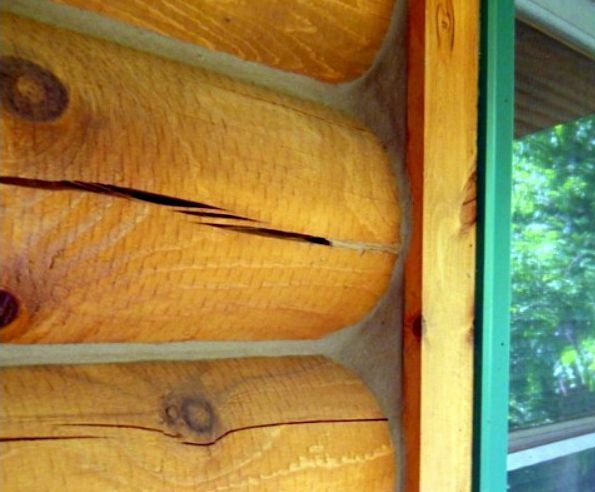 Many log buildings need chinking or caulking to seal gaps that develop between the logs. Over time, logs shrink and shift, which creates gaps that allow air and water to seep between the logs. Proper chinking and caulking seals these gaps, reduces energy expenditures, and keeps log homes and buildings healthy and comfortable. How to apply backer rod and chinking on log home—- Edmunds and Co. from matt edmunds on Vimeo. Seals the gaps between the logs. Fills gaps between the logs and windows, doors, foundations, roof lines and other areas. Prevents air and water from making its way into the log building or cabin. Keeps critters such as bats, bees and mice from making your log home their home. Would you like an estimate on chinking and caulking? Please contact Edmunds & Company and speak with a log home restoration specialist today. Call 715-373-5744. 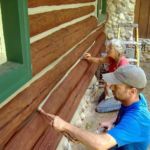 Our teams use time-tested chinking and caulking procedures to ensure that your log home or log building is sealed properly. Chinking comes in about eight different colors – from white to a rich grey, which looks similar to mortar, and from light tan to dark brown. The choice of color is mainly a personal choice of the homeowner. In general, if the logs are small and there will be many chink lines in between them, it is best to stick to a color of chinking that best matches the stain color on the logs. Chinking is installed with either a bulk loading caulk gun or an electric powered chink pump. Once a line of chinking is laid, trowels are used along with other methods to push the chinking in and make a seal between the stacked logs. Foam backer rod may be necessary before laying down the line of chinking. This insulates the line as well as breaks the bond in the center of the line, allowing for more flexibility of the chinking material. This process is repeated on both the top and bottom of the logs. 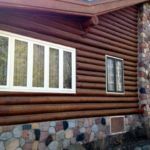 Some homeowners try to chink or caulk their log homes themselves, but it takes experience and the right tools to smooth the lines so they look uniform. 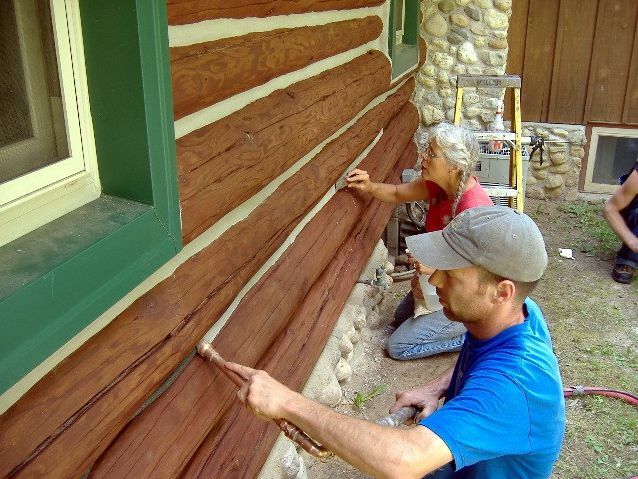 Edmunds & Company has many years of experience chinking and caulking different types of log buildings to restore them to their original beauty and seal gaps that have appeared over the years. When there is lots of chink to be laid, it works best to use an electric pump. Care must be taken to make sure there is a good seal between the chinking and the logs. 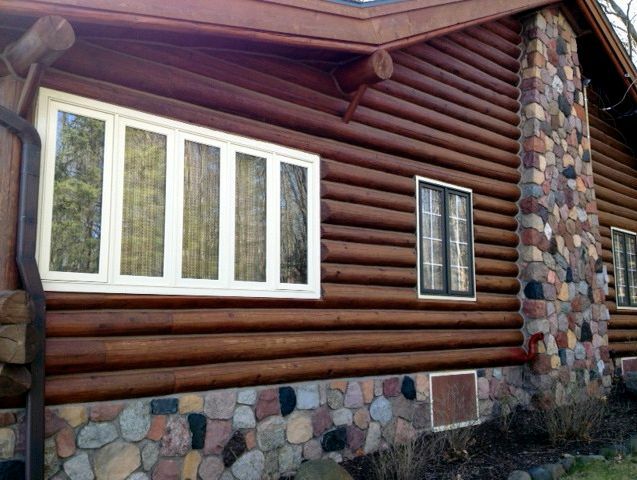 In this log home, the chinking is a contrasting color to the logs and is fairly wide. 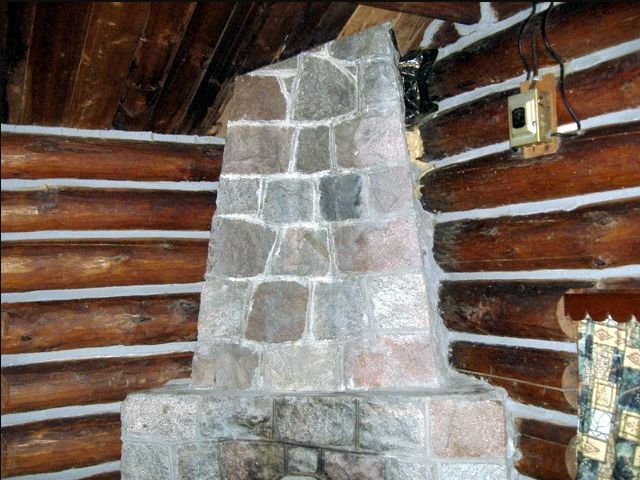 This is a common look in older log homes. 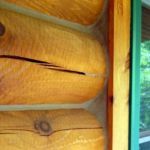 This is a good example of chinking that has been stained along with the logs so it matches. The bulk loading gun works well for repairs and smaller areas. This is an area that gets overlooked when it comes to chinking. Filling in these areas can prevent lots of problems with insects and critters making nests behind the trim. 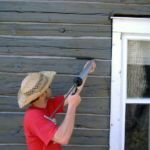 WHEN DO YOU USE CHINKING AND WHEN DO YOU USE CAULKING? Both chinking and caulking rely on latex polymers for adhesion. Chink has fine sand particles added to it where caulk doesn’t. The sand gives the chink a dull or “flat” appearance. Just like aggregate adds strength to a concrete slab – the sand adds strength to the chinking material. Chinking can be used in lines that are from a half-inch to six inches or more wide. When the line is less than a half-inch in width, caulk is a usually a better choice. Edmunds & Company uses Perma-Chink brand chink as our preferred chinking and Big Stretch by Sashco as our preferred caulking because over the years, these two products have performed the best and are the most cost effective. Is It Time to Call the Log Home Experts? Sometimes chinking and caulking jobs require special equipment. Is it time for you to call the log home experts? Contact Edmunds & Company at 715-373-5744 for more information on chinking and caulking.